"Ellen White's Contradictions on Jewelry"
Why was Ella wearing that necklace of shells (Ministry, Oct. 1989, p. 10) that particular day? We don't have a clue. But back in 1991 we were discussing our concerns about this picture with Esther Dubosque, who happened to be the wife of a Seventh-day Adventist evangelist. Lo and behold to our surprise, Esther stated emphatically, "That was my grandmother, and she did not wear jewelry." What could we say? Esther certainly knew her grandmother better than we did, since we never met the lady. Esther added, "She lived at the end of her life at Eden Valley Institute." When it comes to upholding standards of dress and modesty, Eden Valley is one of those places that would make Charles Spurgeon, John Wesley, Charles Finney, and Ellen White proud. It would be highly unlikely that Ella would have been wearing necklaces there, even ones made of shell. But why did the White Estate remove the necklace from the picture? Good question. We don't know. Obviously, their purpose, unlike that of Dirk's picture's editor, was not to slander. And it's hard to condemn them too harshly when photography studios routinely remove moles, scars, and wrinkles from portraits everyday. But it would have been wiser if they had left it alone, given the number of critics out there just waiting to make the most out of any discrepancy they can find. As quoted previously, Dirk Anderson's web page states, "The alteration [in that 1913 photograph] is necessary in order to perpetuate the myth that early SDA's did not wear jewelry." Guess we hadn't heard of that myth before. As we look through Sydney's Cleveland's book, we find another picture of Ella Robinson, this time wearing a pocket watch around her neck. Judging from the similarity in shade to her light collar, we'd say it was probably silver in color, not gold. Her husband Dora is also wearing a pocket watch and chain. Then there's a picture of Mrs. Hettie Haskell wearing a pocket watch suspended around her neck and tucked into her garment near her waist. Cleveland's caption says that Hettie's watch was gold, but we can't verify that from the black and white picture. 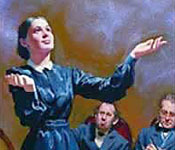 Regardless, neither Ellen White nor the Adventist church has ever taken a stand against wearing watches. Perhaps an outrageously expensive or gaudy one, yes, but not all watches. Watches serve a utilitarian, non-ornamental purpose. The rest of Cleveland's evidence consists of a total of five other pictures of four people from three families, and they are definitely wearing something, though what they were wearing is hard to tell. If we assume that in each case they are indeed wearing ornamental jewelry, even then, the paucity of evidence that Cleveland gives us does not rule out the possibility that most early Adventists did indeed practice what they preached on the subject of jewelry. Her plain white collar was fastened with a simple brooch, and she was hatless, though several in the congregation and on the platform wore hats.—Arthur White, The Later Elmshaven Years, p. 30. It sounds to us like the "simple brooch" of yesteryear was used like the average, simple belt buckle, and thus had a utilitarian purpose. It was a way to fasten a lady's collar together. We are unaware of any instances where Ellen White, Spurgeon, Wesley, or Finney ever condemned the use of simple belt buckles or brooches or pocket watches. If any of our readers know of such instances, please forward them to us without delay. When a young lady begins to backslide, she will begin to put on ornaments, jewelry, and costly attire. These things are natural indications of the state of the heart.—The Finney Sermon Collection, vol. 2, p. 838. But it is marvellous, while many are taking all the trouble they can to array this poor body, they have very few ornaments for their soul; they forgot to dress the soul. . . . really the children of God cannot now be told by outward appearance from the children of the devil, and they really ought to be; there should be some distinction between the one and the other; and although religion allows distinction of rank and dress, yet everything in the Bible cries out against our arraying ourselves, and making ourselves proud, by reason of the goodliness of our apparel. Some will say, "I wish you would leave that alone!" Of course you do, because it applies to yourself. But we let nothing alone which we believe to be in the Scriptures; and while I would not spare any man's soul, honesty to every man's conscience and honesty to myself demands, that I should always speak of that which I see to be an evil breaking out in the Church. We should always take care that in everything we keep as near as possible to the written Word.—Sermon Collection, vol. 1, pp. 516, 517. So, Brother Spurgeon, how should we dress? What sort of adornments may we wear? If some people had a little more piety, they would not require such a showy dress; if they had a little more godliness, to set them off, they would have no need whatever to be always decorating themselves. The best ear-rings that a woman can wear, are the ear-rings of hearing the Word with attention. . . . the very best dress we can ever wear, is a garment wrought by the Holy Spirit, the garment of a consistent conduct. . . . It would be a good thing, perhaps, if we went back to Wesley's rule, to come out from the world in our apparel, and to dress as plainly and neatly as the Quakers . . . . If you want ornaments here they are. Here are jewels, rings, dresses, and all kinds of ornament; men and women, ye may dress yourselves up till ye shine like angels. How can you do it? By dressing yourselves out in benevolence, in love to the saints, in honesty and integrity, in uprightness, in godliness, in brotherly-kindness, in charity. These are the ornaments which angels themselves admire, and which even the word will admire; for men must give admiration to the man or the woman who is arrayed in the jewels of a holy life and godly conversation. I beseech you, brethren, "adorn the doctrine of God our Savior in all things."—Ibid. What is then the meaning of these scriptures [1 Pet. 3:3, 4; 1 Tim. 2:9, 10]? What is it which they forbid? They manifestly forbid ordinary Christians, those in the lower or middle ranks of lift, to be adorned with gold, or pearls, or costly apparel.—Works of John Wesley, vol. 7, p. 30. So where did Ellen White, Spurgeon, Finney, and Wesley get these ideas from? Other parts of the Bible also discuss the subject, but we'll stop with these. What do you think about jewelry in light of the above quotes? Regardless of what Peter, Paul, Wesley, Spurgeon, or Finney wrote, I think there's nothing wrong with wearing all the jewelry you want, wherever you want: ears, fingers, tongues, eyebrows, and belly buttons. Wow! Peter and Paul really wrote that? I believe Christians should follow the Bible, so I guess we shouldn't be wearing ornamental jewelry. I've decided that I'm going to follow the Bible in this area of my life. It's too bad that some people are more interested in criticizing than in saving souls. I suspect that Dirk, Sanders, and Cleveland would have searched through Ellen White's trunk too, if they had the chance. I'm a Baptist/Methodist/Presbyterian, and I've never heard anyone ever say we shouldn't be wearing ornamental jewelry. Why not? What's happened to my church? Why have we drifted away from what we used to teach?